Luxuriously made with crystals on a black matt base, its sparkling glitter decorations will glisten seductively under the party lights. 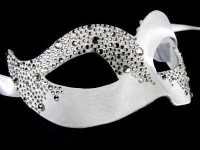 Designed to create an eye catching sparkle at your themed event, in this individually created mask you will enjoy all the glamour of the ball. Why not save this one especially for your Valentine special occasion? When we are asked why we bring you original Venetian luxury masquerade masks, we reply there is nothing to compare with a hand made designer mask over a mass produced or machine made version. And when you look closely at the intricate design, we are sure you will agree. Being hand made, no two masks are ever exactly the same. They may look similar in design but differ in the detail. From the city where the masquerade mask originates, we choose the styles we think you'll like the most. Masks made by artisans in workshops across the city who take great pride in their craft keep alive a tradition started centuries ago. For Venice is the home of the annual carnival (Il Carnevale) and the masquerade mask is its icon. Venetian carnival goers put their heart and soul into their masquerade costumes, hoping to win the cherished prize for the best. This luxury Valentine mask is characteristic of the city that made the masquerade costume famous. Your lovely Valentine mask is designed to be comfortable to wear. It will stay in place for the entire party with the satin ties to keep it secure. Keep the spirit of the carnival alive at your special occasion, have the party of the season in your own Valentine mask and keep it as a memorable souvenir. We deliver free throughout the UK. Order your Valentine mask today.